This post is part of a synchroblog on extreme economic inequality. The list of participants will be posted at the end of this post as soon as they are available. Extreme Income Inequality is a hot topic in theU.S. There are numerous reports, studies and books on the subject. All presenting overwhelming evidence that income inequality is reaching never before seen levels in our country and around the world. A Census Report finds that nearly half (1 in 2) of Americans are poor or low income. A report from the Congressional Budget Office last October found that between the years 1979 and 2007 the average real after-tax household income for the bottom 20 percent rose 18% but the top 1 percent of the population saw their incomes rise 275%. The Organization for Economic Cooperation and Development reported in May 2011 that “the gap between rich and poor in O.E.C.D. countries has reached its highest level for over 30 years.” TheU.S.had a gap of 14 to 1 between the richest ten percent and the poorest ten percent. Extreme income inequality is a fact and so is the possibility that it could prove economically and socially disastrous. Before I go any further I want to address the idea of extreme income inequality and point out that what we are talking about is not “income inequality” but “EXTREME income inequality”. Many people don’t understand the extreme income inequality that is occurring because that kind of wealth is beyond what most of us can imagine. Here are a couple of illustrations that helped me understand the kind of exteme conditions that are occurring. If you made a dollar per second, every second, you’d be making $3,600 per hour and you’d be a millionaire in 11.5 days. But, it would take you 32 years to become a billionaire. If Bill Gates had made his fortune at $3,600 per hour he would have had to be earning that rate of income for 1,600 years. Or… let’s say you earned $29,000 per year (which is the median income in theU.S.). If you made $29,000 a year and never spent a single penny of it you would need to earn that much for 34,482 years in order to save a billion dollars. And yet, there are people in the U.S. who make a billion dollars a year, every year, while the majority of people make “extremely” less than that (obviously if the average income in the U.S. is $29,000 per year). In 2007 Forbes reported 400 people had as much wealth as half of our population. The combined net worth of the Forbes 400 wealthiest Americans in 2007: $1.5 trillion. The combined net worth of the poorest 50% of American households: $1.6 trillion. Now that we have an idea of the extreme income inequality that is occurring let’s look at why it matters. 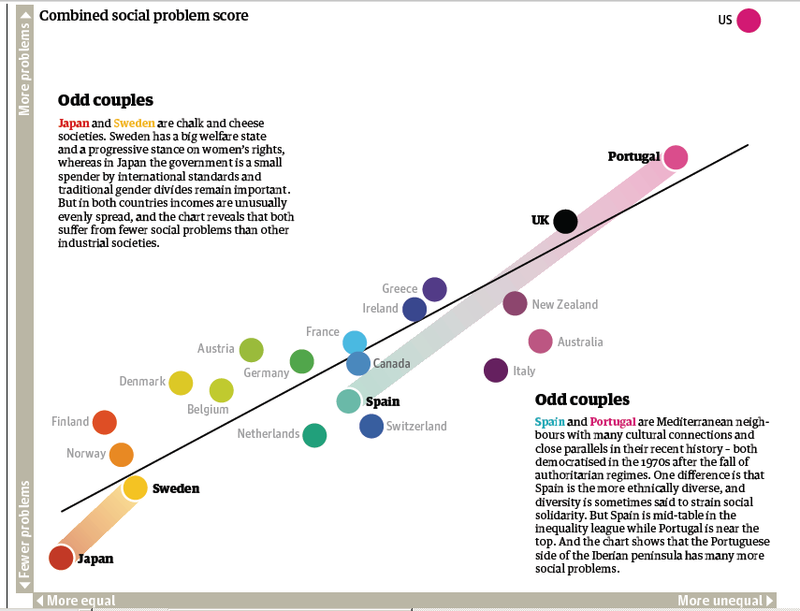 Studies are revealing that many social problems are related to extreme income inequality. A society being too rich or not rich enough does not seem to be the problem. The problem is large gaps between the richest and poorest. Whether it is a country, a state or a neighborhood extreme income inequality seems to affect everyone in the community negatively. Physical health, teen pregnancy, imprisonment, education, trust, life expectancy, mental health, obesity, creativity, murder, innovation – whatever was measured seemed to prove extreme income inequality increases the problem. Physical and mental health are worse, teen pregnancy is higher, more people are imprisoned, people trust other people less, life expectancy is lower, more people are obese, creativity and innovation decrease, murder rates increase as income inequality increases, people are less content. This doesn’t happen just for the poor but for everyone. For example, countries that have the largest gaps have rates of mental illness that are five times higher than countries with the smallest gaps and that includes everyone; a baby born in the U.S. is twice as likely to die before turning one year old as a baby born in Japan where the gap is significantly less; and the average life expectancy for an American is three years shorter than for a Swede who lives in a country that enjoys a lower rate of inequality. AND if you subtract the poor from the analysis the scores don’t change. Extreme income inequality is like a pollutant that spreads throughout society. For more detailed information check out The Spirit Level by Richard Wilkinson and Kate Pickett (or here’s a Ted talk by Richard Wilkinson that does a good job of summarizing the info in the book). In addition to all the social ills, extreme income inequality is not good for the economic condition of a country. (Again, I am not talking about “income inequality” but “EXTREME income inequality”) Billionaires contributed to both the Great Depression and the recent depression. When money becomes mostly concentrated with a small percentage of the population less money is pumped back into the economy because the richest will invest the majority of their money. The increased investment levels vs the decreased money entering the market place leads to inflated bubbles and riskier investments which eventually lead to market crashes. Trickle down economics doesn’t work in the midst of extreme income inequality. The book The Trouble With Billionaires: Why Too Much Money At The Top Is Bad For Everyone by Linda McQuaig and Neil Brooks is an excellent resource for more on this. And finally, extreme income inequality is bad for everyone because obviously the rich will primarily use their wealth to help themselves socially, economically and politically. A vicious cycle occurs where the super rich push for new laws and loop holes that allow them to become even richer, which allows them to push harder, and that makes them even more rich etc. etc. etc. Mega rich billionaires represent a very real threat to democracy as their voices are heard much louder and clearer than the average citizen’s voice is ever heard. For example, the most advanced, lucrative investments are limited to “accredited” investors. The average person may think that indicates some kind of license or education or certification. No, “accredited” investors are the rich. The rich have created investments that only they can invest in! In other words, the “game” is rigged so that the rich can unfairly keep getting richer at the expense of everyone else. Social ills, economic collapse, political corruption are all caused by extreme income inequality but the rich don’t want you to believe it and they have the power and money and connections to get all sorts of information out to you to convince you that extreme income inequality is not a problem. Or sometimes they will tell you that extreme income inequality doesn’t even exist or that it isn’t increasing. “It’s not bad for you” “It has always been this way” “It doesn’t exist” I’m sure you have heard some or all of those. However, overwhelming evidence is beginning to reveal these kinds of statements as a last ditch effort for super rich individuals and big corporations to maintain the status quo. 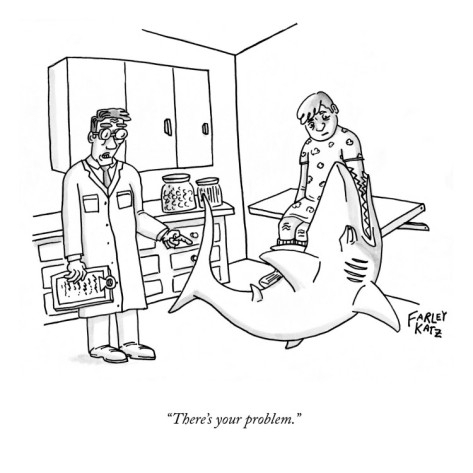 Solutions to the problem will come in a variety of forms. Ending special tax breaks for the rich. Fairer investment regulations. Improved assistance programs. Better public educational systems. Campaign reform. Reformed corporate regulations. Enrichment of opportunity enhancing programs. However, the first step is admitting there is a problem and the evidence in the U. S. and around the world indicates that more and more people are coming to grips with the fact that extreme income inequality is a significant problem and that something has to be done about it. 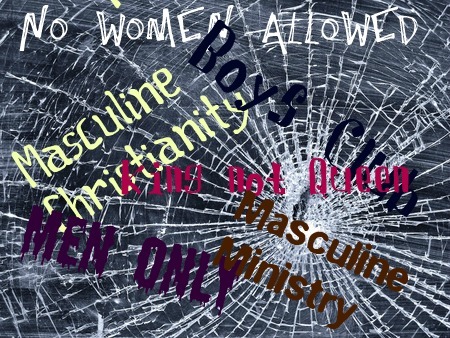 This entry was posted in Economy, Equality, Health, political, Politics, synchroblog and tagged health, income Inequality, social problems, synchroblog on February 7, 2012 by Liz. Wow! 2012 is taking off in a hurry. I have almost waited too long to post any kind of reflection about last year! However, I do want to say something about 2011 so here are a few of my favorite things in 2011. Adele. Sure they overplayed her songs on the radio but before that happened there were those times when hearing her sing was one of those “I’m glad to be alive” moments. So I can’t make a list of favorite things from last year without including Adele. Pinterest. I heard about it and didn’t think it sounded interesting. I tried it anyway and immediately loved it. 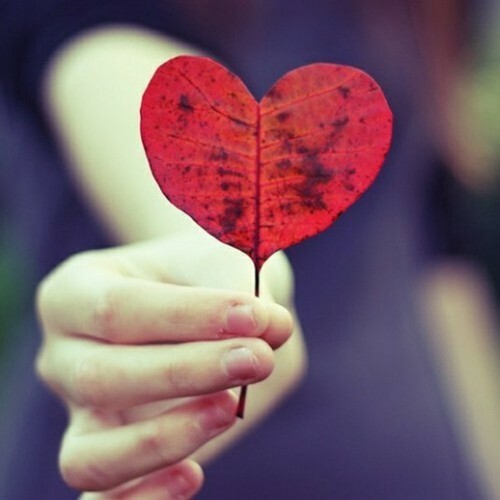 Pinterest is a place to organize and share online images that you find interesting or inspiring. 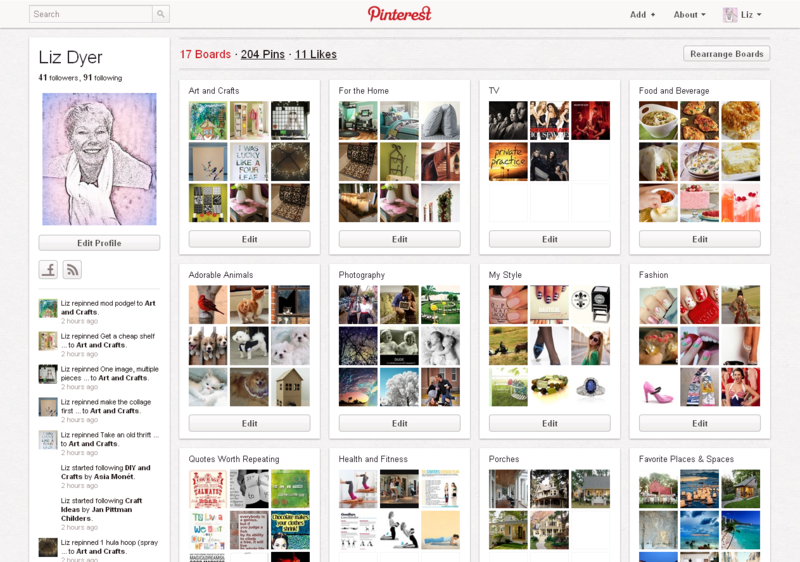 Once uploaded or shared on Pinterest, these images become known as Pins, which the user can place on customized, themed Boards. You can create Boards for any topic imaginable, from cats to classic cars to cats driving classic cars. The possibilities are endless. It’s a lot more fun than it sounds. 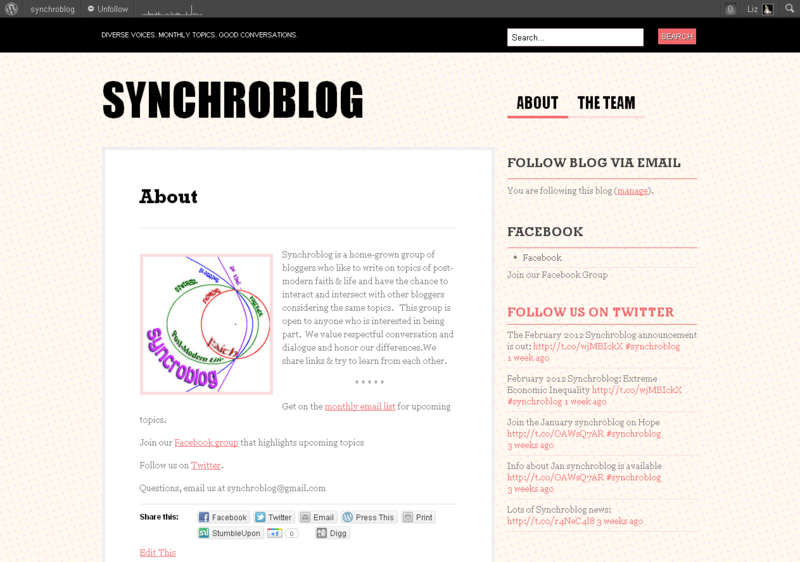 Synchroblog. It’s not new but it remains one of my favorite things year in and year out. A synchroblog is a collection of similar articles or posts made by a group of bloggers who have agreed to blog on the same topic on the same day. 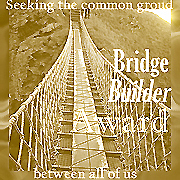 The synchroblog group that I participate with has a different theme each month – such as “The Devil Made Me Do It“, “Hope” and “Experiences In The Wilderness“. I love it because it keeps me writing, connects me with other bloggers and gives me a chance to hear a variety of voices. If you like to blog you should try it out. Timeline. Yes, I like timeline. I have always wished that it was easier to look back at something on Facebook and I also wished for a more visual experience. 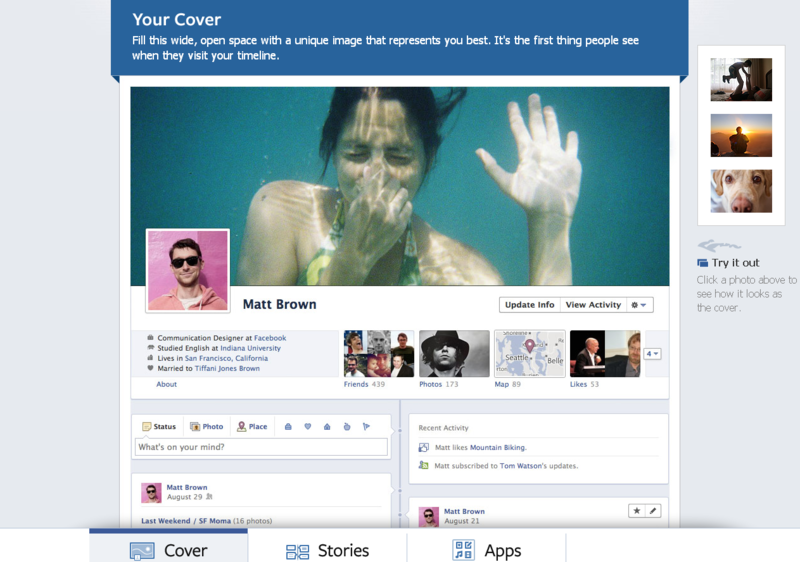 I think that timeline delivers both of those things without losing any of the features that I like about Facebook. I know there has been a lot of complaining but I don’t pay much attention to that as it happens everytime Facebook makes any changes. Timeline was definitely one of my favorite things in 2011! Photo Books. I created some online photobooks for the first time last year, ordered printed copies and absolutely loved them! I love digital photography but I also love having a printed version of a photograph. 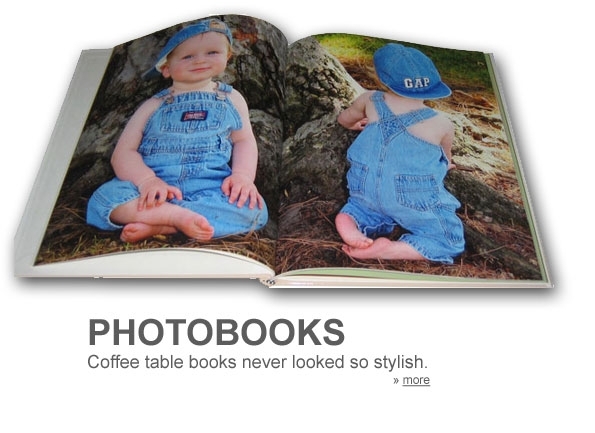 The photo books are a perfect was to enjoy a collection of printed photographs! 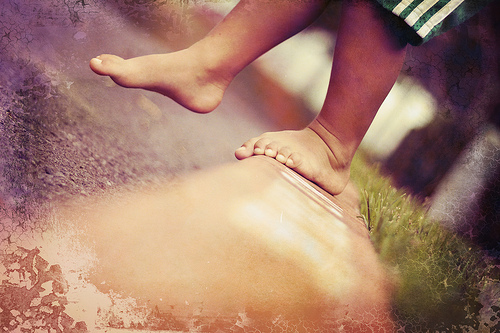 I used Mixbook and liked the process and end product. There were lots of styles/themes to choose from and I had the ability to customize everything. I already have plans for more photo books this year. Paste Magazine. Paste is a leading online destination for pop-culture enthusiasts, covering music, movies, TV, books and video games. Each month you get 4 issues, 28+ high-quality downlodable MP3s, exclusive videos, in-depth articles and more for only $2.99. You can pay monthly, cancel at any time, and never miss an issue! I love Paste Magazine! The Girl With The Dragon Tattoo by Steig Larson. 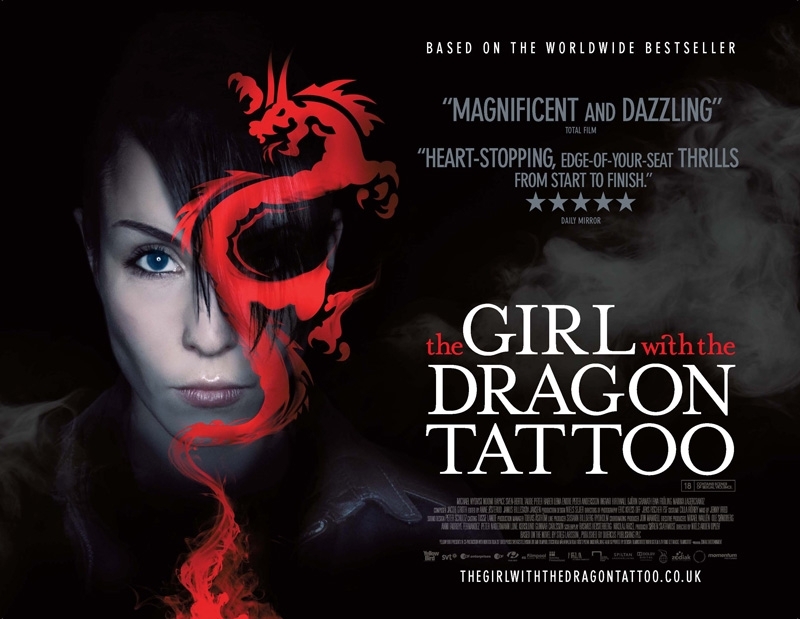 The book trilogy (Dragon Tattoo Trilogy) and the movie (only the first one is a movie at this point)! The characters are rich and interesting, the stories unique and dark. I was intrigued throughout all three books and for a change I thought the movie was just as good. I suggest reading the books first and then seeing the movie. Provoketive Magazine. It’s like a blog but better. 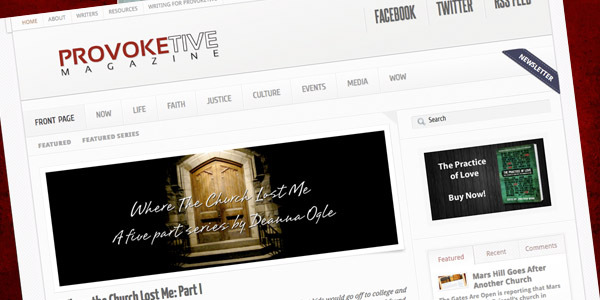 Provoketive Magazine is an online space of rich conversation about life, faith, justice and culture. The desire is to provoke the reader’s imagination through conversation and open up spaces of dialogue, learning, and hope. It is one of the fastest growing online magazines and has over 120 writers contributing to it’s content. If you would like to contribute to Provoketive, begin here. 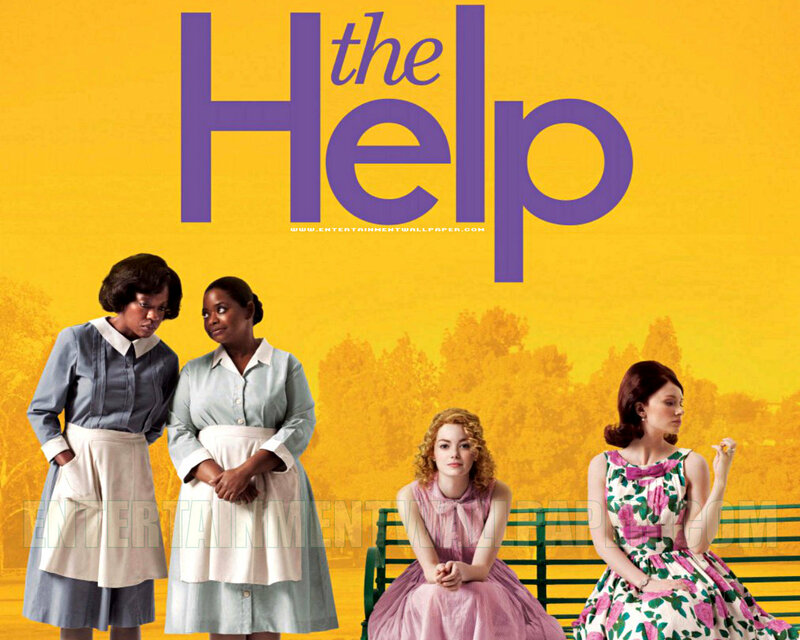 The Help. I always see a lot of movies and this past year was no different. At one point during the year I had been to the same theatre 14 weeks in a row (at least that is what Foursquare reported to me). As usual I saw the good, the bad and the ugly. The Help was one of the good ones. I had read the book quite a long time before the movie released and had almost forgotten how much I liked the book. The movie reminded me how good the book was and I was pleasantly surprised that the movie was just as good (although the book did have some great story lines that weren’t covered much in the movie). I am glad to see it is getting some recognition and hope to see it win some more awards during the Oscars later this month. Spotify. Oh, how I love Spotify. Who would have ever believed that there would be an app that was free where you could listen to practically any song you knew anytime you wanted! 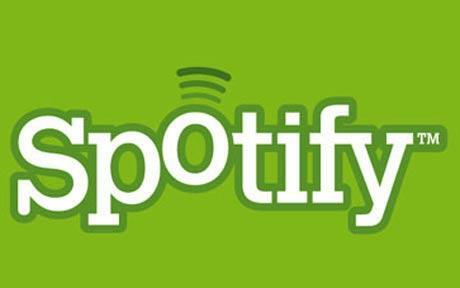 On top of that Spotify has all sorts of social networking features that help you share the music you are listening to and discover new music when your friends share what they are listening to with you. It’s amazing!!!! And for a small monthly fee you can even take it with you on your smart phone, your ipad or your ipod! Amazing!!!!!!!!! Those were a few of my favorite things in 2011. What were some of yours? This entry was posted in blogging, books, entertainment, film, Movie, movies, music, synchroblog, technology and tagged Adele, Facebook, Mixbook, Paste Magazine, Photo Books, Pinterest, Provoketive Magazine, synchroblog, The Girl With The Dragon Tattoo, The Help, Timeline on February 1, 2012 by Liz.